Since coming here," an African student told an American friend, "I've discovered the white man has two gods — one that he taught us about, and another to whom he prays. A mission school taught me that the tribal doctrines of my ancestors, who worshiped images and believed in witchcraft, were wrong and almost ludicrous. But here you worship larger images — cars and electrical appliances. I honestly can't see the difference." This disillusioned young man had discerned that modern "Christianity" had strayed a long way from the original teachings of Christ. The realization hit him like a thunderbolt. Let's take a case in point. Jesus Christ declared: "You have heard the saying, 'You must love your neighbour and hate your enemy.' But I tell you, love your enemies and pray for those who persecute you..." (Matthew 5:43-44, Moffatt translation). Do professing Christians in our Western culture follow Christ by loving their enemies and turning the other cheek (Matthew 5:39) as He commanded? Of course not. That would not be practical, we are told. The truth is that most of the greatest and bloodiest wars in all history have been waged primarily in Europe — the very heart of Western Christian civilization. Were the men, women and even children involved in these wars true followers of the humble carpenter of Nazareth who said: "Love your enemies"? Remember that these people called themselves by the name of Christ — "Christian." 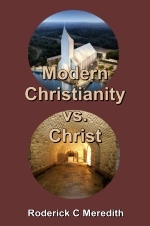 It seems that nearly all Western religions, philosophies and sects persist in applying the name of Christ to their ideas, teachings and practices, however far removed from the teachings of Christ they may be. In ancient times, the pagans at least honestly and openly acknowledged the idols they worshiped. Did Christ start these ideas and institutions? Do they follow His teaching and His example? How can you know? What was the teaching of Jesus Christ? The only authoritative answer is found in the inspired record of what Jesus did teach and in the perfect example He set for us to follow. Your own Bible contains this inspired record. With the above questions in mind, let's look into the Bible honestly, openly and without prejudice. What did Jesus — the Author of true Christianity — actually teach and do? And remember that a true "Christian" is one who follows Christ and His teaching! The word "kingdom" implies government. Jesus was talking about the coming government of God over this earth. He commanded: "Repent ye, and believe the gospel"! To repent means to be so sorry that you are not only willing to quit living in what theologians call "sin" — but that you are also willing to turn around and go the other way. But what is sin? God answers, "Sin is the transgression of the law" (I John 3:4). Again, notice Jesus' own inspired words on this subject: "Think not [although many do want to think this] that I am come to destroy the law, or the prophets: I am not come to destroy, but to fulfil" (Matthew 5:17). Greek scholars acknowledge that the word translated "fulfil" means not only to do or perform, but also to fill to the full. In other words, Jesus, in His own life, filled to the full and perfectly performed the spiritual intent and purpose of God's law — to love God with all your might and to love your neighbor as yourself. Why did He do this? To do away with God's law by this means? That's what men will try to tell you! The ultimate criterion for right and wrong, many church leaders say, is not divine command, but the individual's subjective perception of what is good for himself. "We are delivered from the law," they expostulate. But let God answer. In a prophecy about the coming Messiah, Isaiah wrote: "The Lord is well pleased for his righteousness' sake; he will magnify the law, and make it honourable" (Isaiah 42:21). Jesus continued in this same discourse: "Whosoever therefore shall break one of these least commandments, and shall teach men" so, he shall be called the least in the kingdom of heaven: but whosoever shall do and teach them, the saine shall be called great in the kingdom of heaven" (Matthew 5:19). So according to Jesus' teaching, you have to both do and teach even the least of God's commandments if you are to become great in His Kingdom. This is just the opposite of the common teaching of "Christianity" today. Probably you were taught to believe Jesus did away with the law of God. Jesus showed that even to hate a brother — involving as it does the spirit of murder — is bringing us into judgment before the spiritual law of God (Matthew 5:21-26). He vividly illustrated how one can commit adultery not only by performing the act, but also by just lusting after a woman in his heart (verses 27-28). Read these examples in your own Bible. Think about them. In every case they obviously do not do away with God's law, but rather they make it all the more binding! Did Jesus Set a Perfect Example? Remember, a Christian is one who literally follows the example of Jesus Christ! Jesus was the "light" that God sent into the world to show man how he ought to live. "That was the true Light, which lighteth every man that cometh into the world" (John 1:9). Peter was inspired to record that Jesus Christ lived according to God's ways, leaving us an example, that we should follow His steps (I Peter 2:21). Jesus obeyed God. He did not sin — and sin is the "transgression of the law." Rather He obeyed God and suffered willingly in service to others, and in all this, set an example "for us to follow. Jesus lived a life of giving and serving. He conducted Himself as an ambassador of a foreign kingdom or government — God's government in heaven which will soon come to earth to replace all human governments. How many "Christians" really believe this? Paul was inspired to write that Jesus Christ is the same yesterday, today, and forever (Hebrews 13:8). Christ has not changed. He will guide you to live the same kind of life today that He lived in His own human body 1900 years ago. And remember, Jesus "was in all points tempted like as we are, yet without sin" (Hebrews 4:15). How will Jesus guide you to do this? The apostle Paul put it this way, describing his own experience: "I am crucified with Christ: nevertheless I live; yet not I, but Christ liveth in me: and the life which I now live in the flesh I live by the faith of the Son of God, who loved me, and gave himself for me" (Galatians 2:20). Through the Holy Spirit, then, you can receive the very nature and power of Christ to obey the commandments and laws of Almighty God. The Holy Spirit imparts the power to keep God's spiritual law. It is His righteousness operating in your body, a body that you have willingly yielded to Him as His instrument. What percentage of "Christians" do that today? But how does one receive God's Holy Spirit? Peter addressed a large audience of people in his day, saying, "Repent, and be baptized everyone of you in the name of Jesus Christ for the remission of sins, and ye shall receive the gift of the Holy Spirit" (Acts 2:38). This same principle applies to our day. Since your old self must be figuratively buried — baptized for the remission of sin — you must first repent of sin. That means to repent of breaking God's law! Then, after truly repenting and accepting, through faith, Christ's shed blood as payment for your past sins, you must be baptized in order to receive the gift of God's Holy Spirit. Baptism — immersion in a watery grave — is an outward acknowledgment of the death penalty you have brought upon yourself by disobeying the la w of your Creator and is also an acknowledgment of your willingness to let your old self figuratively die. Then, through His Spirit, Christ places His nature within you, — His love, His faith, His strength to overcome your own nature and the temptations of Satan and of this world (see Galatians 5:22-23). The love you receive through God's Spirit is not mere human love, but the very love of God, which "... is shed abroad in our hearts by the Holy Spirit which is given unto us" (Romans 5:5). Now how does this love operate? Christ's Word gives the true answer: "For this is the love of God, that we keep his commandments: and his commandments are not grievous" (I John 5:3). It is through God's love placed in us by His Spirit that we are able to keep His commandments! Through constant Bible study, earnest prayer, and consistent spiritual overcoming and growth, you can yield to let God fashion you in His spiritual image, so that you can be born of Him in the resurrection as His own son — having His very nature. Down through history, God has always set apart those who truly serve Him by keeping His commandments and His laws. The apostle John was inspired to write: "He that saith, I know him, and keepeth not his commandments, is a liar, and the truth is not in him" (I John 2:4). A person who isn't keeping God's commandments does not grasp the kind of character and personality that the true God is. He is not truly "acquainted" with God! He is simply manufacturing his own private "god" out of his own imagination. Can we believe that God means what He says in His inspired Word? The true God doesn't even hear our prayers unless we keep His commandments! "And whatsoever we ask, we receive of him, because we keep his commandments, and do those things that are pleasing in his sight" (I John 3:22). How many professing Christians believe this? Today, as the African student perceived, millions of deceived people worship a sentimental, manufactured "god" who requires no obedience. They have been deceived into believing that the importance of worshiping the true God of creation — the God who requires obedience to His will as a prerequisite for receiving the gift of eternal life — can be lightly set aside. But God states: "Whosoever transgresseth, and abideth not in the doctrine of Christ [the very teachings of Jesus Himself], hath not God. He that abideth in the doctrine of Christ, he hath both the Father and the Son. If there come any unto you, and bring not this doctrine, receive him not into your house, neither bid him God speed: For he that biddeth him God speed is partaker of his evil deeds" (II John 9-11). Obedience will make you happy and fill your life with real inner joy. This obedience is what sets real Christians apart from the millions who assume that they are Christians but who have strayed far from the simple truths taught by Jesus.